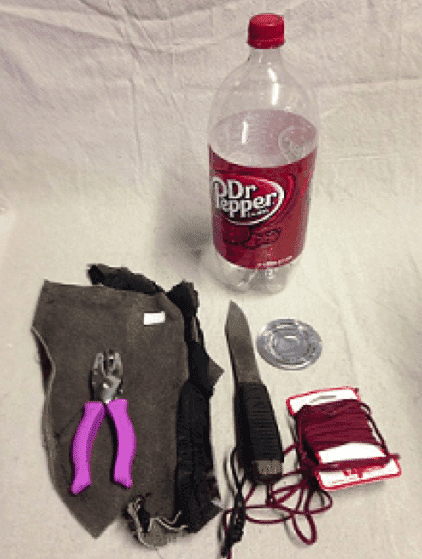 Many popular bushcraft knives commonly used are not supplied with their own sheath. Two very popular such knives are the Old Hickory 7 inch butcher made by Ontario Knife Company and the Green River 5 inch hunter made by Russell Harrington Cutlery (now called Dexter-Russell). 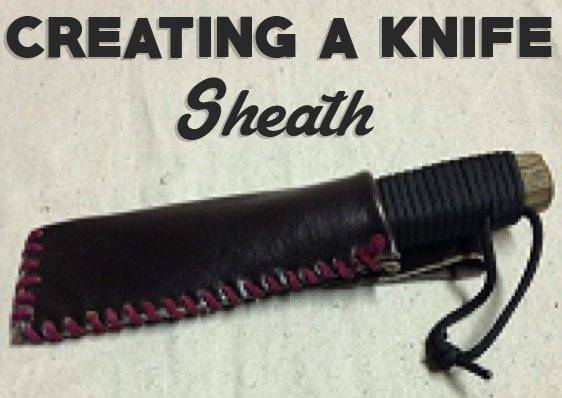 They are reliable, easy on the wallet, and made in the U.S.A. Sheaths for these can purchased at several online stores, however the sheaths cost as much as (or more than) the knife. In this article we will discuss how you can make a good sheath for little money. 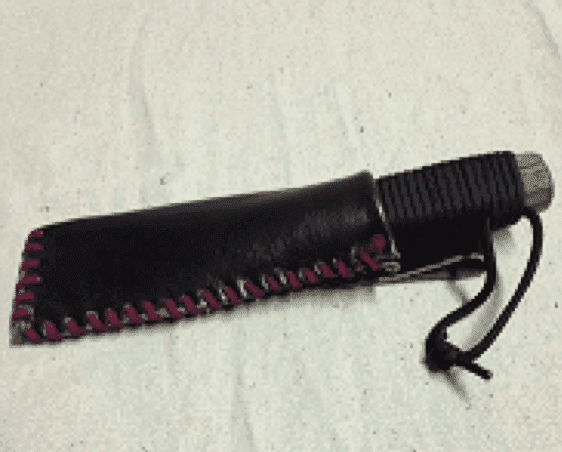 We are going to create a soft leather sheath with a hard plastic liner and an internal metal cap. The leather is nice and sturdy. The plastic provides rigidity. 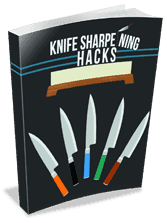 The metal keeps the knife’s tip from penetrating the bottom. 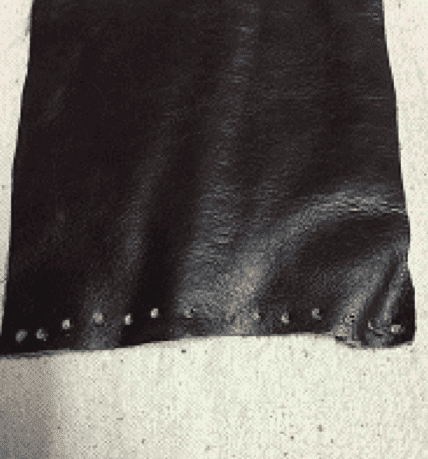 Lay out the leather with the finished side facing down. Lay the knife on one side of the leather. 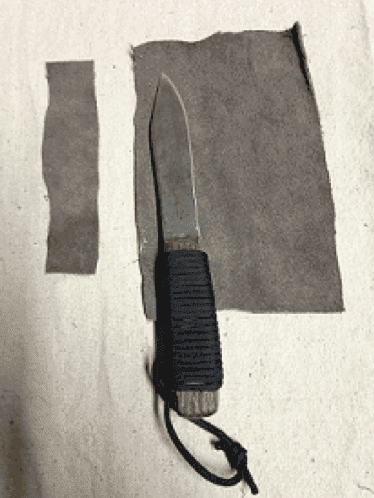 Cut out a section of the leather that wraps around the blade and meets on the other side of the knife with at least ¼ inch extra. 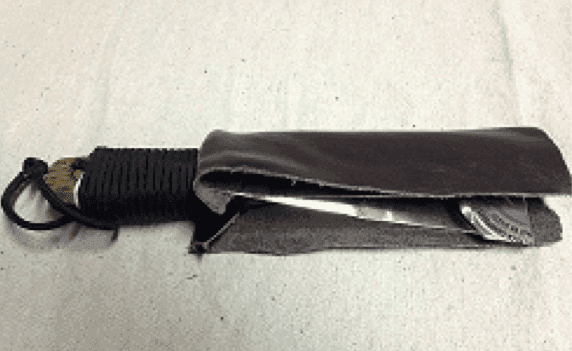 Make sure the leather wraps around half of the handle and the entire blade with at least ¼ inch extending past the tip of the blade. Cut out another strip of leather 6-8 inches long and 1 inch wide. Cut the top and bottom off of the bottle. 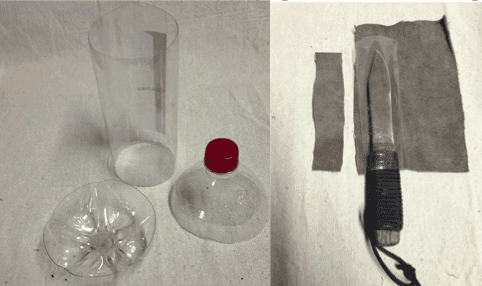 Repeat the same process with the rest of the bottle that we performed with the leather. This time however do not allow ¼ inch extra on the sides or the tip. 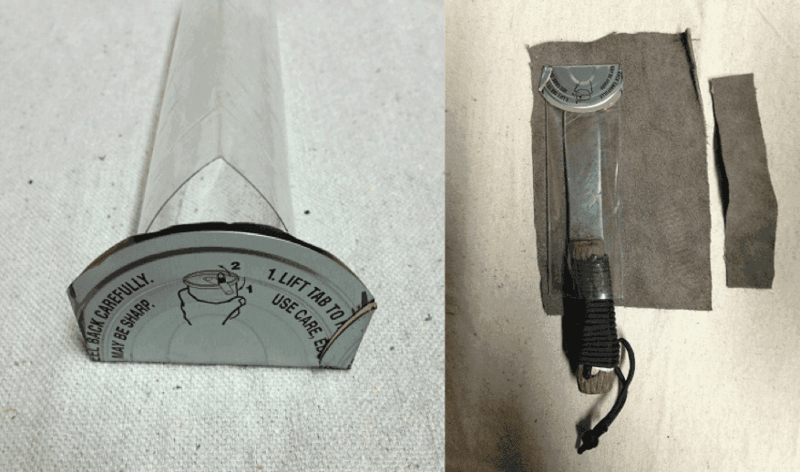 The plastic should wrap around the entire blade and ¼ of the way up the handle. 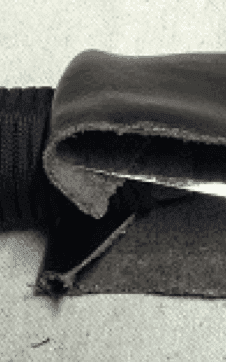 Fold the plastic in half lengthwise so it fits within the leather. Fold the soup can lid in half to create a semi-circle. Insert one end of the plastic sleeve into the semi-circle. Fold in the edges of the lid and wrap around the sides. 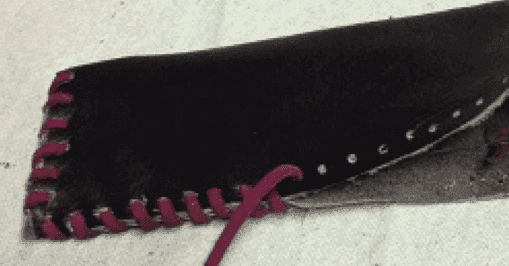 As you can see it forms a metal cap that will prevent the knife from poking through the leather. The plastic prevents the edge from cutting the leather. Fold the leather in half. Punch holes in both sides along the bottom starting from the crease going all the way to the corner. Do not put a hole in the crease itself. Continue punching holes around the corner and ¼ of the way up the side. Be sure to keep ¼ inch between holes. Tie an overhand knot in one end of the cord. Leave ½ inch of tag hanging out of one side. Pull the long end through the first pair of holes. Wrap the cord under the holes and around to the next set of holes to create a simple spiral stitch. Continue this for several stitches until you’re halfway across the bottom of the sheath. Then tuck the tag end into the stitches next to it. Tighten all stitches thus far with needle nose pliers. Continue stitching all the way until your last hole. 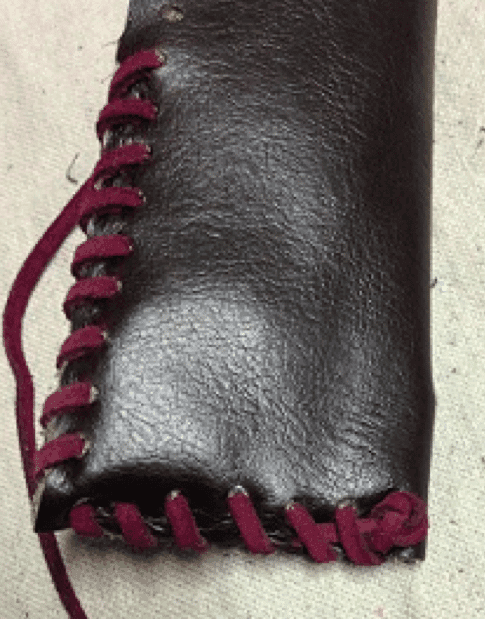 Push the plastic and metal insert into the pocket created in the leather so far. Make sure the metal lid goes all the way to the bottom. The opening in the side of the plastic should face the same direction as the opening in the leather. 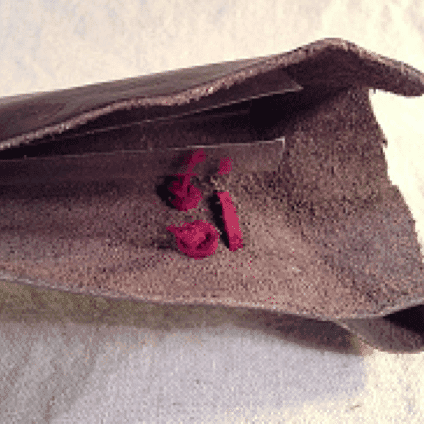 Fold the leather at the top over the edge of the plastic. 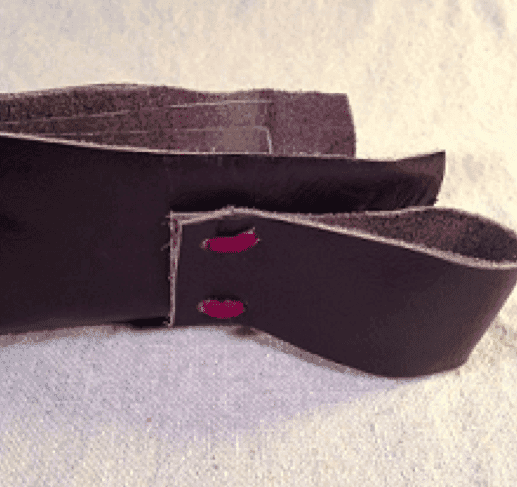 Take the leather strip and punch 4 holes in each end. Make sure the holes match up when folded in half lengthwise. Punch 4 more holes (matching the strip) in one side of the sheath. The lowest hole should be placed no more than one inch down the leather. Fold the strip in half. Take a 6 inch length of cord and again tie an overhand knot in one end. Pull the knot through a hole in the back of the sheath from the inside, leaving the knot between the plastic and leather. Pull it through a set of matched holes in the strip. Stitch over and under until the cord comes back out of the inside of the sheath. Tie another overhand knot as close and as tight as possible to the inside. This creates the belt loop. Punch holes (leaving ¼ inch between each) all the way up the edge in both sides continuing from the last stitch. Punch two holes in the top folded over portion (being careful not to put holes in the top edge/crease) on both sides. Since it is folded over it will create 4 layers. Make sure the holes match up. Continue spiral stitching all the way up the edge. Tighten all stitches in the edge with needle nose pliers as you go. The last sets of holes in the top folded edge may be difficult. You may have to thin the cord down to a point to get it through. Once through, tighten all stitches in the edge. Tie another over hand knot in the end as close and tight to the leather as possible. Tuck any remaining tag under the last few stitches. You are done. I hope this article has given you some insight that there are often less expensive (yet quality) options and ways to accomplish different tasks. The biggest wallet does not always win. Thanks so much. I made one for myself, finally.